I have to admit that even as a Beatles fan, I was slightly skeptical of the 50th anniversary special commemorating their first appearance on the Ed Sullivan Show. It’s not that I didn’t think it’d be filled with good performances. Rather, I was wary of it not capturing the essence of The Beatles, which means something very different, I’m sure, to a fan born several years after 1964 versus someone who watched the Ed Sullivan Show live that February 9th. When I talk with other people about The Beatles, those who aren’t fans — and there are many more than I expect– automatically bring up “I Want To Hold Your Hand” or another one of their early hits. (It’s probably much like what Beach Boys fans hear from people who mention “I Get Around”.) 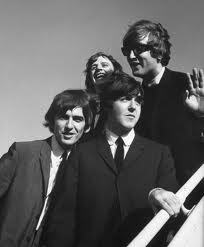 They think of Beatlemania and the screaming girls and the matching suits. This is a far place from where I am, having “discovered” The Beatles through Sgt. Pepper and The White Album. Rather than rehash that early period, last night’s show transcended that time of frenzy and wove many aspects of The Beatles’ contributions in a way that paid homage to the foundation of their influence on music. It didn’t all begin 50 years ago, and it has continued long after, but that event from 1964 made all that came after possible. Imagine Dragons did an incredible rendition of “Revolution”. They chose a more R&B treatment, kind of like what the skiffle bands of The Beatles’ origins would have done. It was interesting to see a young band use an old sound for a truly fresh take that didn’t stray too far from the originals. Ed Sheeran paid beautiful tribute to “In My Life,” a song so amazing that everyone should learn the words and melodies the way we know Happy Birthday. Few have expressed love of any and every kind so well. Dave Grohl, Joe Walsh and Gary Clark, Jr., really warmed up the theater with “While My Guitar Gently Weeps,” before Ringo Starr came out as the lead-in to the finale featuring him and Paul. By then, everyone was loose and moving. Usually when you see televised performances like this (the Grammys, etc. ), only a few of the artists get up and really enjoy the music. Last night, we saw no stiff faces or self-conscious masks of boredom. Both Ringo and Paul McCartney turned out solid performances. While Ringo was never known for his singing voice, he’s clearly an entertainer in front of and behind the drums. McCartney is always amazing. He may not have the vocal range he once did, but he is present for every minute of every song. The (remaining) Beatles showed tonight why they are, in fact, The Beatles… why they occupy that echelon above all others. By the end of the evening, the audience was engrossed. Almost every performer who played one of their songs displayed a sense of gratitude to the music. (My one criticism about the evening was that artists who clearly weren’t inspired had the opportunity to perform. With all the talent available, they could have found an alternative to Alicia Keys, who seemed almost dismissive.) Not only have The Beatles inspired people to love their music, they’ve inspired people to love all kinds of music. Who can deny this after seeing that whole theater under the influence of “Yellow Submarine”? Drill down to a single person sitting on her couch in Illinois. My opening Facebook comment about the performance was that I did a better job singing “Ticket To Ride” on my couch than Adam Levine. I don’t think that I am a better singer than him. Rather, there’s a passion in loving a song, in having sung a song thousands of times (quite possibly more than Adam Levine) that makes the difference. That is The Beatles’ legacy. And to my surprise, the 50th anniversary special captured it. Click here for a great recap from Billboard, including the set list. Guns are our problem, not God’s. Fall. Surrender. Restore. Rise. Repeat. They're more interesting than you think.